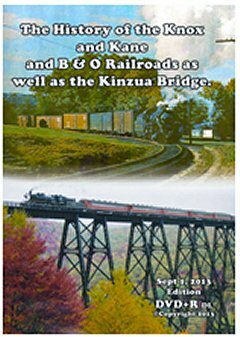 Mikado Productions of Dayton, Ohio has released this new video with over 30 minutes of scenes of the Knox and Kane Railroad running from and over the Kinzua Bridge from Marienville. The video includes at least three crossings of the Kinzua Bridge by steam driven trains of the Knox and Kane Railroad. One section of the video contains a re-release of portions of the 1990 VHS video by Berkshire Productions produced for Sloan Cornell, the founder of the Knox and Kane Railroad. The DVD shows significant original material including background of the Northern Subdivision of the Baltimore and Ohio Railroad which owned the line before. It concludes with an Honor Roll of individuals who made contributions to either the B&O or the Knox and Kane.